« Annual AGM this month! The Executive of the BCKA cordially invites you to participate in a kite making workshop with Master Kite Maker, Mr. Dan Kurahashi. Dan will teach two kinds of heat sealed kites. You can choose to build one or both of these kites. If you’d like to join in this fun and informative kite making workshop, please confirm your attendance with me ASAP so I can guarantee you a space. 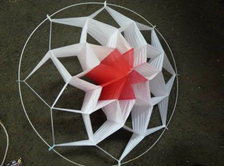 Space will be limited to 12 kite makers. Coffee and goodies will be provided. Please bring a bagged lunch. See details and photos of the project below. 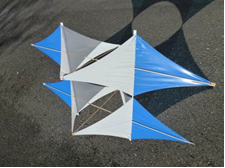 *Peter Lynn 3D kite, 40″ wide, 20″ front to back, 28″ tall. Copper modified tip with Teflon cover. Stable (not tippy) Ceramic coffee mug use as soldering Iron rest whilst hot. Tweezer to be used to avoid burn from touching soldering iron, I am brave or stupid I do not use it.